A-53, Sector 57, Noida 201301, India. Suresh Menon is considered as being one of India's finest writers and it is not difficult to see why from this excellent book. This book is slightly different in as far as it does not have match by match details but instead charts India's rich cricket history, how the country won the World Cup twenty-eight years ago for the first time and what cricket means to Indians. Chapters are also dedicated to two of the leading players of India's success, Yuvraj and Zaheer, and also the importance of coach, Gary Kirsten, and the very considerable influence he gave to the team. The book also states in a further chapter how India knew how much they had to do without peaking too quickly in the first part of the tournament and how, in the knockout stages, they knew how to up their performance and ultimately bring glory to themselves as players and joy to this vastly cricket-mad cricketing nation. I have to say that I had to chuckle at one of Suresh's astute observations that Indians like cricketing celebrities more than the actual cricket and I have to freely admit that I too fall within this category! There are many further knowledgeable observations and this excellent book gives a fascinating insight into Indian Cricket and how it has evolved and become the most powerful nation off the field. The main matches are adequately covered and embellished with some particularly fine photographs. There is a very detailed match by match scorecard at the end and the book is beautifully presented although there is one small typing error in one of the scorecards put down as England vs Netherlands which should have read Bangladesh vs Netherlands. 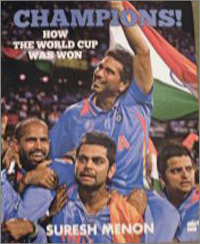 Although I have been unable to date to find this book in England, I would recommend English readers to contact Harper Collins in India to try to obtain a copy not only for a memento of the exciting 2011 World Cup but for a better understanding of Indian cricket.